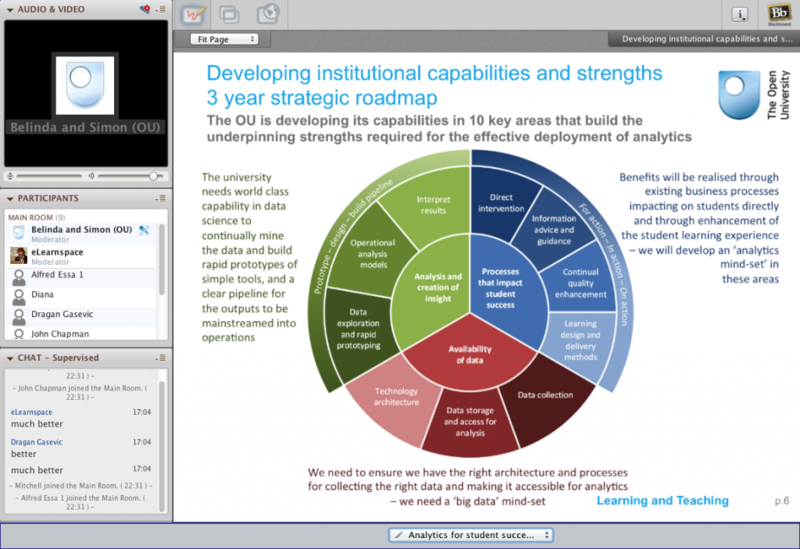 Replay from my webinar today with Belinda Tynan (OU’s PVC Learning & Teaching), as part of the SoLAR online open course Strategy & Policy for Systemic Learning Analytics. Thanks to the Australian Office for Learning and Technology for sponsoring this, and to George Siemens for convening. Abstract: The OU has been analysing student data and feeding this back to faculties since its doors opened 40 years ago. However, the emergence of learning analytics technologies open new possibilities for engaging in more effective sensemaking of richer learner data, and more timely interventions. We will introduce the framework we are developing to orchestrate the rollout of a systemic organisational analytics infrastructure (both human and technical), and discuss some of the issues that arise. We will also describe how strategic research efforts will key into this design, should they prove effective.